Garden & Gun magazine is my latest good read. I have always loved my monthly copy of Southern Living. In fact, I have very vivid memories of devouring stacks of old issues one after another on rainy days at home (occasionally cutting out pictures for a school project or 2) . 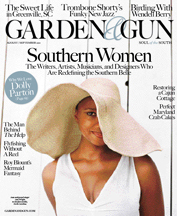 And, while I am still a Southern Living girl at heart, Garden & Gun is a great sister read. It's a smaller 'zine with fewer issues during the year (bi-monthly), but so far I'm loving our August/September edition. In fact, I think all of you would get a kick out of this month's cover story Redefining the Southern Belle. I had skimmed the article the first time I flipped through the magazine, but I am so glad I went back to read every word. 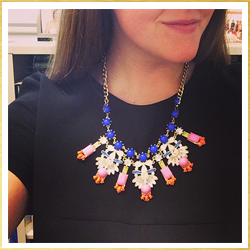 It certainly puts the icing on the red-velvet cake about what it means to be a Southern woman. Be sure to read-up on all of the amazing women that are highlighted including Emily Giffin & Kathryn Stockett, and be on the lookout for the magazine in and around town. Or, maybe even subscribe! Found you from the link up. Have a great rest of the week!